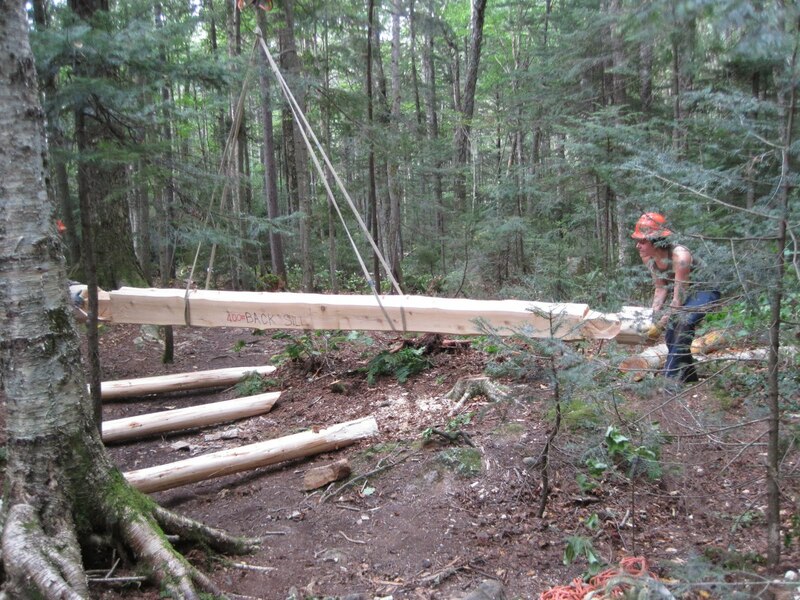 Backcountry construction is all about logistical preparation. Tools and lumber are heavy, so you want to minimize your pack load but yet bring enough to get the job done. Heading to the hardware store for the correct fastener can take half a day. You better double check your measurements and write them down, because you can’t check your voicemail or look through your email when you’re in the woods. And power tools? Well, they are all fine and good, if you feel like carrying enough batteries or a gas powered generator. The logistics of lining up the work involves coordinating staff, vehicles, materials, and, of course, the helicopter company. In building Eliza Brook shelter, we worked in phases, working from the ground up: Phase I was setting the foundation posts. Phase II was building the decking and setting the sills. Both of these phases needed to be accomplished with precision, since what Phase I and II do is set the stage for the final step (Phase III), which was airlifting the disassembled shelter built by John Nininger’s Wooden House Company and reassembling on site. We’ll save Phase III for a later post. For right now, let’s turn to the backbreaking labor and painstaking precision that attends foundation work. 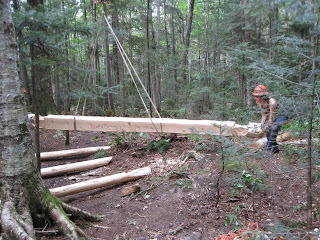 And, also, the reality of building a structure in the backcountry. 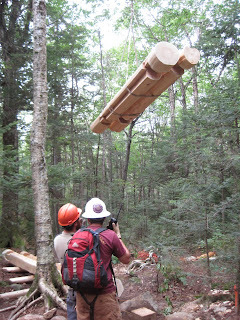 The logistics of Phase I began in May, when we airlifted three 8x8 posts to the campsite in anticipation of the work that would take place in August. 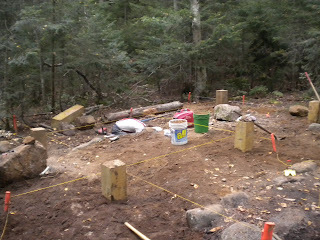 After cutting them on site to approximate 4 foot lengths, we had our six footings. 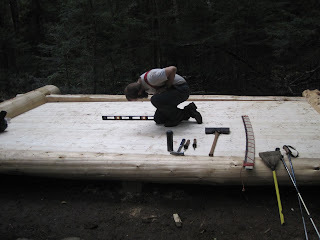 Being well aware of the technical skill and art that goes into John’s log scribing, it was all more important that we build a solid, level, even foundation. We are fortunate in that Mike Foster, our Field Coordinator, grew up in a family that owns and operates a concrete company. 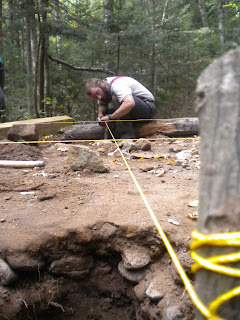 So we measured, squared out the corners, marked them, and then started digging. As we hit rocks, our holes got bigger. To get a sense of how deep the holes need to be, by the time we hit the requisite three feet, we could sit comfortably in the holes with only our heads sticking out. Many whack-a-mole jokes took place during this phase of the project. Phase I was not without some backcountry construction errors: we decided to leave the heavy rock drill and generator behind, taking the risk that the ground would be without ledge or insurmountable boulders. 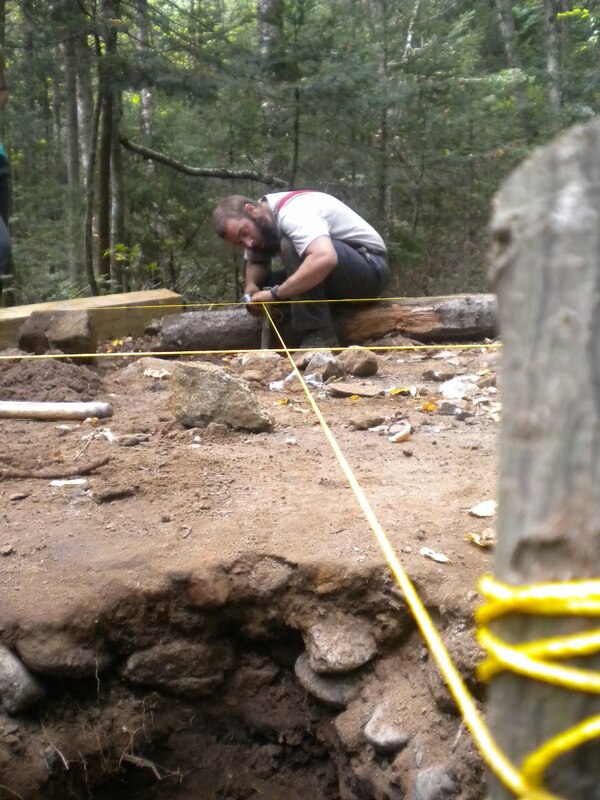 By the end of the first day, the crew wanted the rock drill for blasting through large rocks at or near the bottom of the holes, as well as affixing a base plate for one of the posts. The good news was that the rock drill was waiting in the truck at the bottom of the trail. The bad news was that the trailhead was 4 miles away. Retrieving the rock drill took the better part of a day. Another error we discovered when we left the woods, after we had squared the corners, strung lines, and packed the posts tightly with mineral soil. Turns out our dimensions were off by a foot. Two of the corner posts needed to be moved. Relatively easy to fix. But we didn’t have time to dwell too much on the mixups, since we headed directly into preparations for Phase II (building the floor of the shelter, onto the footings we had set) with the helicopter airlift scheduled for three days later. The tools for assembling the deck required more thought: wood chisels, cordless drills (and batteries), socket wrenches (with appropriate sizes), squares, autolevel and tripod, various nails and bolts, joist hangers. Two tips to pass along, should any of you desire to take up work in this field. First, write down the tools you fly in, so you know what’s up there when you’re sitting down in the valley scratching your head for the next job, wondering what you have up there. Second, cut all lumber to length before you airlift it in. 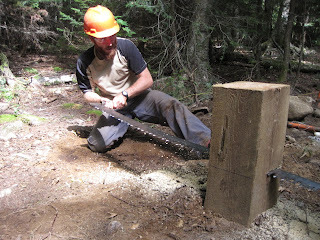 It’s much easier to cut lumber in the frontcountry, armed with a circular saw and an easy way to dispose of the scraps. Airlifts in the trails world are always exciting. They involve being dropped over half a mile away from the site, often on rugged and uneven terrain. 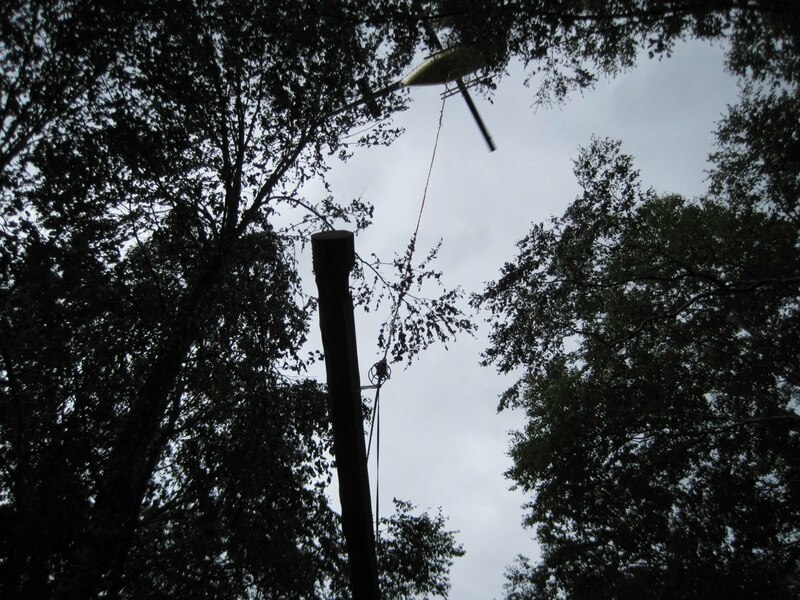 The spots in which we receive loads from the helicopter take place deep in the woods off-trail or in a heavily canopied shelter campsite. Eliza was one of the more dramatic airlift spots: the top crew had to sprint almost a mile to the campsite from where we get dropped, and the canopy is so thick that the pilot couldn’t see us on the ground moving the loads while the tall birches whipped from the downwash. As the long sill logs came in, two people would guide the load to the landing zone, while Carl Svenson (our expert pilot from Joe Brigham helicopter services) would adjust to our movements until he had the signal to release the load from the radio person on the ground. In less than an hour, the airlift was over. Carl flew on to a job with the AMC Huts, and two crewmembers, Mike Foster and Beau Etter- Garrett (our Mahoosuc Rover) stayed on at Eliza to relocate the two posts, cut them level, place the sill logs and assemble the deck. They made quick work of the posts, using a crosscut saw in the absence of a chainsaw operator, fixing the front and back sills to the posts with lag bolts, and then John’s side sill logs popped immediately into place. (It should be noted that the back sill weighed 400 pounds, and Beau and Mike moved it by hand). And building a backcountry deck? Well, sometimes it’s just as easy as building a deck in the frontcountry. Phase II was completed within 36 hours, with no missing tools, no error in measurements, and with some time (a week and a half) to gather our bearings before the final Phase III, of bringing a beautifully crafted shelter together for the first time. Which, of course, was not without its own human error. More on that later.